Hidden away in a complex in Chickpet, Basavaraj Market is a mini, fabric heaven. Be prepared to be dazzled with an array of embroidered, 3D, and shibori silk yardage. That Chickpet is fabulous is well known. And to add to its awesomeness is Basavaraj Market! 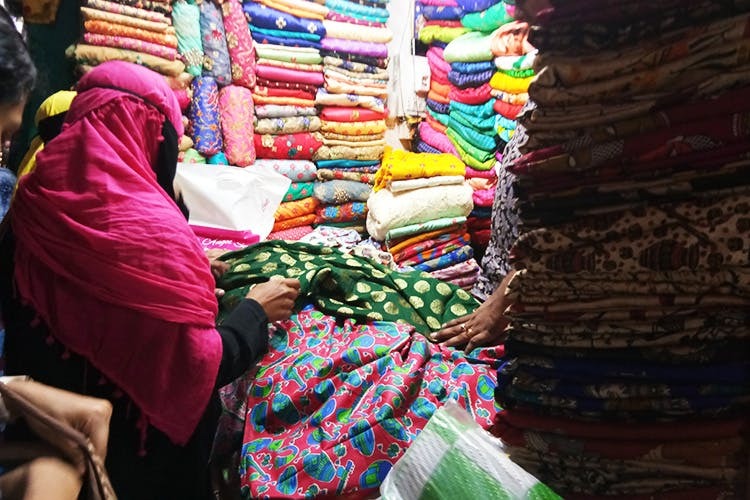 Located close to Nagarathpet and Raja Market , the dimly-lit complex is a dream come true for all you ladies who love fabrics and want to fill up their wardrobe with custom-made outfits. Shop after shop, at Basavaraj Market, is stacked to the rafters with trendy fabrics. While the stock keeps changing according to what’s topping the fashion charts, on our recent trip here, we spotted gorgeous (faux) shibori silks that’ll make lovely dresses. Available in serene pinks and greens, these come with artful dye prints that’ll steal your heart. Each shop also displayed stacks of synthetics with Buddha motifs or delicate flowers or fun spinning top prints. These are great for work wear and prices begin at about INR 100 per metre. Bulk of the offerings at this busy market are ideal for that shaadi you have been looking forward for months. On overboard beams, you’ll see sea-green, raw-silk type materials embroidered pink and gold flowers. Then there are brocades of all colours, from light pinks to rich golds. You can also get georgettes in bright blues and greens. Looking to make a dress? Train your eyes on the 3D Net fabric. We picked up a grey one with elegant branches and studded with peony yellow, 3D flowers. There were others do too that’ll have you looking that you stepped out of a fairytale. Prices for the fancier fabrics begin at INR 250. But since this a wholesale market, make sure you bargain especially if you are buying in bulk. The sellers here specialise in synthetics so if you are looking for cottons or handlooms, this is not the place for you. On Google Maps, this place is marked as Baba Market .